Few can forget his bespectacled, intelligent face, softened by a dimpled smile as the sardonic, unconventional hero or manipulating villain of the stage or popular drama serial. But for many professionals involved in the world of drama, whether the stage or television or big screen, Abdullah Al Mamun, who passed away on August 21, will always be the mentor and friend who held their hand for the first tentative steps that would lead to a soaring world of drama that is intense, entertaining and eternally rewarding. Abdullah Al Mamun and leading theatre activist Ramendu Majumdar, go a long way back. Not only have they been good friends, both Mamun and Ramendu practically grew up together trying to establish themselves in the world of theatre as well. Later, Ferdausi Majumdar with whom Mamun worked professionally, also became a staunch friend. Tropa Majumdar, Ramendu and Ferdausi's daughter, has also been involved in theatre and television since the early 1990s and worked closely with Abdullah Al Mamun. In fact, it was he who encouraged her to direct the play 'Mukti', saying that his generation could not go on working forever. Ever since a very young age, Mamun had been engrossed in his own world, filled with books, theatre and people. "He was an introvert," says Ramendu. "He had very few friends even though he knew a lot of people. Many would misunderstand this side of his." In fact, Mamun would never join the many meetings, rallies and processions that Ramendu and the others would get involved with, adds Ramendu. 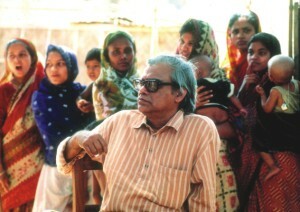 Mamun was one of the main architects in developing the theatre scene in Bangladesh. According to Ramendu, Mamun as a playwright had given birth to a new dimension where theatre in Bangladesh was concerned. "Several theatre groups have worked on many of his written dramas," says Ramendu. "All of Mamun's written works contain a strong message and are very contemporary. This clearly speaks of his success as a playwright." As an actor, in one word, he was marvellous, says Ramendu. Acting and working in theatre, television and cinema are very separate experiences and require plenty of hard work, intelligence and both mental and physical strength. "Mamun excelled in all of them," says Ramendu. In 'Paer Awaj Paoa Jai,' his character Matbor acquired a lot of critical acclaim. "Every time he would make his entry on stage, the audience would be astounded with the power of his performance," he says. "In plays like 'Aekhono Kritodash' where he would play a disabled truck driver and also in Tagore's 'Ghore Baire,' Mamun, as an actor was versatile and would literally amaze people with his characters." Over the last few decades, Mamun also introduced and worked with several actors in the media, namely, Ferdausi Majumdar, Tareque Anam, Towkir Ahmed and many more. He had also made a name for himself as one of the best directors in the worlds of theatre, television and cinema as well. "Mamun knew how to get the emotions and the expressions out of any actor after working with him or her for a while," says Ramendu. "That was yet another talent that he had as a director." Ramendu says that being a director, Mamun would hardly ever demonstrate any of the scenes himself. Rather, he would get the actors to express themselves by talking to them and helping them understand the depth of a scene and the emotions of a character. "Even as a caster, he could sense which actor would play a role perfectly," adds Ramendu. 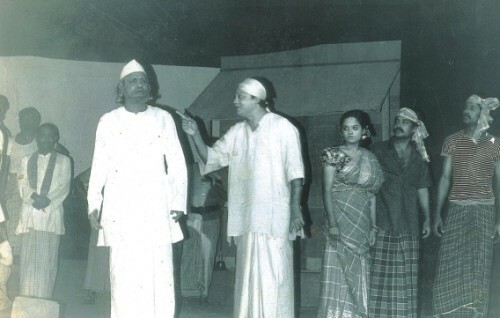 A scene from the play 'Shenapoti'. Having written and directed numerous plays and dramas, Mamun was also a genius when it came to handling television technicalities. "Back in the 60s, television plays used to be shown live from the studio," says Ramendu. "Recordings had not begun. Managing a whole team, including actors and the production crew for the live shoots was not easy. Mamun, on the other hand, not only excelled in this field, but also wrote a new play for these live shoots every week." "It was sometime in 1962 when Abdullah Al Mamun had come to me for an audtion," says Atiqul Huque Chowdhury, currently the Director of Programmes at Ekushey Television (ETV). "Back then, I was the Programme Organiser with Radio Pakistan. Mamun was a student of History at Dhaka University. I believe he had come for an audition along with Ramendu Majumdar, both students back then. Mamun was a longhaired young fellow, who did not rush like other youngsters while walking or talking. Both Ramendu and Mamun were interested to audition for the radio dramas that were extremely popular back in those days. Mamun had even suggested Munier Chowdhury's 'Dondo Dhor' for the audition, where he did the role of the father." Atiqul was clearly blown away by the confidence shown by young Mamun. "In fact, I had not even heard of Mamun and wasn't aware that he was involved with the theatre at the university and had also written a few plays." For the first time, it was on Radio Pakistan that Mamun was exposed in the electronic media back in the 60s, playing the part of the father on 'Dondo Dhor', which was a part of a university magazine show produced and directed by Atiqul. "Mamun was smiling all the while, saying that he would probably never play a part of a nayok (hero) in any drama," remembers Atiqul. According to Atiqul, Mamun might not have been tall, dark and handsome and did not have the features that a typical Bangladeshi hero required, but he did have the strong characteristics and intelligence that made him a stronge and unconventional hero in many dramas later on. Mamun, with his talent and skills, broke all conventions in Bangladeshi dramas on television and also in the field of theatre. "I told him that the following year, television would be coming to Bangladesh," says Atiqul. "I promised him that I would cast him as a hero in my dramas, if I ever got a chance to work in television of course." Atiqul did get to work in television. In fact, he was the Deputy Director General (DDG) of Bangladesh Television (BTV) for a very long time. "Mamun joined the television before me however," he says. "But I had kept my promise and cast him as a hero in several of my plays. He clearly deserved to play the main roles thanks to his acting skills." Mamun playing the character of Matbor in the famous play 'Paer Awaj Paoa Jai'. Ever since he was a young man, Mamun was extremely perceptive as a person and very hard-working. "He was absolutely passionate about his work and would spend hours and hours studying his characters," says Atiqul. "Artistes like Abdullah Al Mamun, Selim Al Deen, Ferdousi Majumdar, Humayun Faridi, Subarna Mustafa, Asaduzamman Noor, Afzal Hossain and Raisul Islam Asad are what we call, international stars." 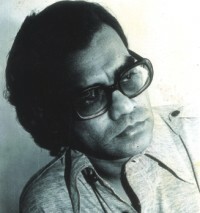 Abdullah Al Mamun made his place in cinema with films such as Sareng Bou, Shokhi Tumi Kaar and Ekhoni Shomoy, which he directed. Actress and film director Kabori Sarwar knew Abdullah Al Mamun from the mid-sixties. She says she was a "fan" of his work even before she had met him. Her first work with him was a drama in which the two played the main roles. After that, she acted in Shahidullah Kaiser's Shangshaptak directed by Mamun, in the role of Rabeya or "Rabu" (played by Subarna Mustafa in the later version). In the late 70s, despite many other actresses vying for the role, Abdullah Al Mamun sought out Kabori to play the leading lady in the highly-acclaimed Sareng Bou (1979), also written by Shahidullah Kaiser. Shahidullah Kaiser made in his novel was that we shouldn't make such differentiations between religion and life. Life is not for religion, religion is for life." Kabori still remembers the scene in the movie where her husband, played by actor Faruk, said "Nobitun, tui amake paur kore dili" (you have cast me away) and she tells him, "Jaan bachano farz" (saving lives comes before everything else), and looks up at the sky with tears in her eyes. "During the shooting, from the camera people and light crew to everyone on the set was moved by that scene," says Kabori. She mentions another scene where one of the men who had his eyes on Nobitun tried to sexually harass her. "I was running through the jute field and when he attacked me, the tall jute rushes became bent and crushed. Later there was blood pouring from my mouth from having bitten the man's ear so that he was forced to let me go. It was such an artistic way of portraying the incident." "Mamun bhai had great aesthetic sense," says Kabori, "We didn't spend a lot of time together off the set, but we had a really good understanding and working relationship. He would have detailed discussions with his artists before the shots, making us understand the characters, the costumes, every detail, so as to make everything seem more realistic. Sometimes I would say that something could be portrayed in a certain way, and he would help me to understand how it would be better if I did it differently." 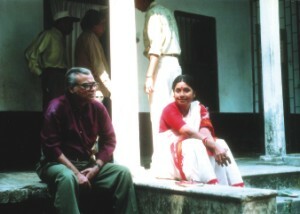 During the shooting of a documentary on Ferdausi Majumdar. technology, to really understand the art. "Over the years, when I would sometimes meet him, he would say, 'Sareng Bou-er Kabori ke jodi abar petam!' (if only there would be another Kabori from Sareng Bou) and I would say, 'You won't get another Kabori, Mamun bhai' and we would both laugh. It was an honour to work with Mamun bhai and Sareng Bou was an unforgettable experience." It is perhaps human nature to value such multi-talented individuals only after they are gone. Though he has received many accolades for his works there will always be a feeling that there was so much more he could have given to us. Sadly, his last hours were spent in great physical suffering, which makes his departure so tragic. As the curtain closes on another era of drama which Abdullah Al Mamun rightfully represented, we can only hope that the young generation of actors, directors and filmmakers will draw from the wealth of knowledge, experience and innovation that he has left behind and attain the freedom of expression that he continuously strived for. Abdullah Al Mamun left us when we needed him the most. Bangladesh is at the threshold of a new awakening, waiting for a fresh start in its journey forward. Al Mamun, one of the pioneers of the neo-theatre movement after 1971, had to leave life's stage, bringing to a close yet another era of intense creativity and vision. Starting early as a playwright for theatre and then becoming a versatile actor and director, Mamun also acquired an iconic status in the arena of television drama and is also known for initiating many of the well-known artistes of television and stage drama. Mamun was born in Jamalpur on July 13, 1942 to Abdul Kuddus and Fatema Khatun. He wrote his first play 'Niotir Parihash' when he was in Class nine in the early 50s. When he was studying for his Intermediate exams at Dhaka College, he often performed in the college plays. Later, when he joined Dhaka University he, along with some of his friends and teachers including Shaheed Munier Chowdhury, formed the Teachers Students Centre to stage plays as there were no formal theatrical groups at the time. After independence Mamun and his friends formed the drama group Theatre in 1972 and began a publication under the same name. 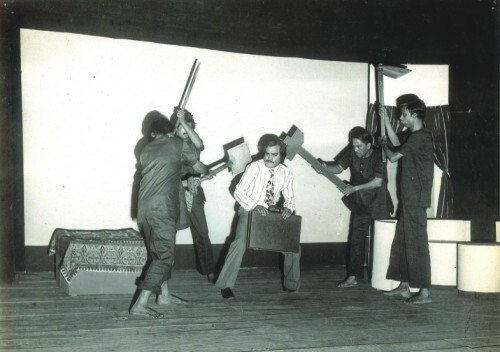 In 1974 Mamun's first stage play for any theatrical group, 'Shubochan Nirbashone', was staged paving the way for many other productions. During his lifetime, Mamun had written about 22 stage plays, all of them centred around characters and stories of the middle class. His theatrical group Theatre has produced 16 of these plays, most of them directed by Mamun where he also acted. His acclaimed play scripts include 'Ekhono Kritodash', 'Tomrai', 'Kokilara' and 'Meraj Fakir-er Maa'. After completing his academic education, Mamun joined the daily Sangbad as a reporter followed by a shift to the then Pakistan Television (PTV) in 1965. He became a producer in 1967. After retiring from the post of Deputy Director General he became the DG of the National Institute of Mass Communication (NIMCO). He also became the DG of the Shilpakala Academy. Although Mamun had a long list of very popular TV dramas including the first daily soap Joar Bhata, he was far from pleased with the development of drama in the state-owned television station where he was so deeply associated. He lamented that BTV had become a static institution, as there was no attempt to develop new talents. Too much government control since the mid-eighties, Mamun thought, had choked the scope for creative development. Private channels, he believed, had many young and dynamic talents but here too the overriding control of sponsors was not conducive to improvements in the programmes as the artistes, directors, playwrights and technical crew had very little freedom. Mamun has admitted that he too had become part of the system and said that sometimes he had not been able to keep up with the standard of his earlier works such as a popular drama serial 'Shangshaptak' because of these constraints. Other drama serials that he has directed include 'Gharoya', 'Pathar Somoy', 'Baba', 'Shirshobindu', 'Uttaradhikar', 'Shesh Bikeler Meye', 'Ami Tumi She', 'Ek Janame' and 'Ekjon Babar'. At the same time Mamun has expressed that there are talented artistes and technical hands who had the potential to be at par with their counterparts in India and hoped that the government would take the initiative to launch Bangladeshi channels in India. Multi-talented as he was, it was no surprise that Mamun excelled in yet another artistic field, the big screen, one that continued to remain virtually unexplored and neglected. His first film was Angikar in 1972 and in 1978 he was widely acclaimed for Sareng Bou starring Kabori and Faruq. Other box office hits included Ekhoni Shomoy, Dui Jibon, Shokhi Tumi Kaar and Bihanga. He has written 25 dramas and seven novels, an autobiography ‘Amar Ami' and a travelogue 'Manhattan’. 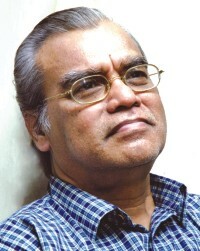 As far as recognition goes, Mamun has received many awards including the Ekushey Padak, Bangla Academy Literature Award, Alakta Sahitya Purashkar and Tarokalok Padak. Mamun had been admitted to Square Hospital on July 10 after suffering brain haemorrhage. He underwent brain surgery on July 13. He had been suffering from diabetes, kidney complaints and heart disease over a long period. He died after prolonged illness at BIRDEM Hospital on August 21 at the age of 65. Mamun had been acting in the ‘Doria Parer Doulati' film that he was also directing. Acknowledgement: Interview of Abdullah Al Mamun by Ershad Komol, Arts and Entertainment, The Daily Star, September 3, 2004. And then is heard no more! Abdullah Al Mamun was half lying on his bed pale and weak. His forehead still had streaks of sweat. On seeing me he tried to sit up, as was customary with his very civil nature, wearing so familiar a smile that he used to greet people with. Earlier I had heard from a fellow actor that Mamun had collapsed on stage while performing in the play 'Spaurdha' a little while ago that evening. I rushed to his apartment at the Eskaton Garden. He said that he had pulled through yet again and described what happened. Incidentally, he had had similar condition once before while performing in his play 'Shenapoti' on the stage. He had hypoglycaemia, a manifestation that a diabetic may have when blood sugar falls abnormally and rapidly. The best treatment is to swallow some sugar or eat some candies and the condition is reversed. Otherwise it may lead to far worse condition as a cerebral stroke etc. He was told by his physician what to do in an emergency like that but he was not being able to articulate. He thought he had said 'sugar' but was told by his fellow actors that he was inaudible. Fortunately, there was a doctor in the midst of the audience who came up on the stage and gave him the necessary first aid. Mamun told me smilingly that, could there be anything better than to have 'gone' on stage? What a dramatic exit that would have been! Every great actor dreams of an exit like that. Leave with an élan- a matter of great significance for an actor. The last word or silence you leave behind lingers on. Isn't that what every actor aspires for? As I mentioned before this was not the first time he had such a condition on the stage. However, that did not deter him from giving his best for his first love, acting. And directing, and producing. Mamun was a couple of years senior to me while in the Dhaka University. Therefore, going by the tradition of those days, he was Mamun bhai. As is customary in our society, a bhai could not be a friend. Besides, I was also not in to the field of drama those days to be able to come close to him. I came in contact with him much later, after the independence of the country. He was controlling the cameras, producing the play 'Buro Shalikher Ghare Ro' by Michael Madhusudan Datta directed by Ataur Rahman and staged by Nagorik Natya Sampradaya for BTV. It was then that we got to know each other. We talked about the possibility of starting to stage plays on a regular basis just as in all other major theatre centres of the world. It was during those days that I would frequent his house. He used to live in Dilu road those days and started serious work on stage almost immediately afterwards for his group 'Theatre'. In the beginning, he did more of writing plays and directing those than acting. Later when he took to acting on the stage is when his prowess as an actor came to light. Of the characters he did on the stage, I would mention three that I consider outstanding. His role of Matbor in Syed Shamsul Haq's 'Paer Awaj Paoa Jai' was exceedingly well crafted. I should think, that was the finest acting of his that I ever saw on stage. Two other characters acted by him that will stand the test of time; and is worth mentioning in this connection; are those of Bakka Mia, a physically disabled beggar who was reduced to an animal in his worldly behaviour now howling - now growling in frustration in his play 'Aekhono Kritodash'. And that of Gaada Fakir in 'Meraj Fakirer Maa'. His stage direction was also not wanting of the craft that he showed in his acting abilities. I remember distinctly the entry on stage of the daughter of Matbor in 'Paer Awaj Paoa Jai'. This part was enacted by Ferdausi Majumdar, one of our finest actors of the stage, but in the first appearance of the character, there was a distinct sign of excellence of direction. An atmosphere was built and commotion heightened to befit the drama that was created by this entry. I dare say that in television production of plays we have yet to come across a more creative and skilful producer. I have had the privilege of working with him in a number of single episode plays and also serials as an actor and have yet to see any one quite matching up to his production competence. I had the opportunity of seeing him work within the control room where he used to command four cameras viewing a scene from various angles and distance and used to switch cameras with the ease of a magician with a wand. The wand, in this case, being snapping of fingers. He was a producer of a rare breed who undertook the challenge of bringing such great plays as 'Bishub Rekha', 'Kobor' by Shaheed Munier Chowdhury and 'Taranga Bhanga' by Syed Waliullah. Taranga Bhanga was considered a play of the genre of the Theatre of the Absurd and was avoided by producers for fear of losing popularity. Mamun could not care less. He was an artist par excellence forever willing to accept challenges. I have worked with him in innumerable plays. They are so many that I do not even remember all the names. I acted in 'Hoimonti' by Rabindranath Tagore, 'Taranga Bhanga', 'Kobor', 'Abashor', 'Pathar Shomoi', so on and so forth. Each experience was unforgettable. After each performance, he used to come down to the make-up room of the BTV with the characteristic smile on his lips. He never spoke a lot. But that smile said it all. Even a day before he was hospitalised and went into a coma I had a chat with him over phone. This was to invite Mamun to the opening of our studio. I knew he would love to come. He sounded so normal and full of life. He even took the direction to the studio and promised that he would. Later I came to know that by then he had already suffered a stroke and part of his body was paralysed. But the very private person that he was, he would not let me be perturbed by his health condition. I sure would miss the smile of Mamun that said it all. Adieu Mamun. We all will miss you very much.